Russia: EU Energy Measures "Totally Unfair"
Russian government officials and energy company executives (they're the same people) reacted to proposed EU energy legislation at the end of last week with what can only be properly described as a hissy fit. The European Union has recently considered lessening state-control of the energy sector within Europe but fears that 'unbundling' energy companies might leave them open to purchase by Russian companies that are directly controled by members of the Kremlin. A number of legislative measures will be discussed in Brussels on Sep 19. The Kremlin is not so pleased. Really, it seems they're quite offended. 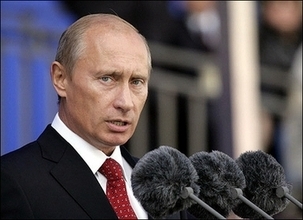 Alexander Medvedev called the proposed measures 'economic nationalism'. The deputy press secretary for the Kremlin also chimed in, declaring: "measures to discriminate against Russian companies would be totally unfair." Why is big, mean Europe being so "totally unfair?" 1) There was last week. Yes... There was one remaining private oil company in Russia (it had a whole 3% of the market). The Kremlin forced the owner to sell his company to a Kremlin insider after pressure from trumped-up charges. Then Moscow courts issued warrants for his arrest. Rumor has it, he's in Britain now. Hmm... I wonder if he likes Polonium in his tea? "The development of the global political process will depend on Russia's decision on where to send its oil and gas. It's enough to deprive a rival of energy for development – in the geopolitical battle, such an act could be a defining moment." When you indoctrinate your school children to understand that you're going to use energy supplies to extort other countries politically, the other countries might suspect you plan to do it. 3) There's just something about forming huge, state-controlled, corporate monopolies, putting ex-KGB men at the top of them, and giving all of their employees the legal right to carry firearms, that makes everyone a little nervous. In fact, after writing this out, it's pretty clear to me that these measures in some form are critical for European security. Sorry guys, maybe those years in the KGB never really hammered home life's sad, sad truth -- sometimes things just aren't fair. In this post, I respond to a comment from LibSocialistssuck. 1) You say: "you..say that pepole only use income from investments to pay mortgages." I don't say that people only use investment income to make mortgage payments, but I see why you say I did. The post wasn't too clear here. Thanks for alerting me. Obviously, people pay their bills with whatever cash or credit they have, whether a consumer credit card, income from investments or work, etc... Money is money, right? 2) You say "People have MORE money due to tax cuts." This is true if you get caught up in one statistic. But a broader look at statistics suggests the opposite. It's doubtful the middle class has more money overall, and they certainly have less spending power. As I wrote in the post (and as the NYT article detailed) incomes have gone down over the past five years when adjusted for inflation by $476. So, according to the limited statistics we have, incomes actually went down $158. And, even if this weren't true, you'll at least agree with me that $318 really doesn't buy much these days? Won't you? 3) You say: "People have the freedom to spend their money how they choose"
I agree with you completely. But I don't see how this relates to the post or the current volatility in world markets. Perhaps you will clarify in a new comment? 4) You say: "People CHOSE to get mortgages on variable rates/ballon payments... ...it's Bush's fault how?" It's not Bush's fault that people took variable rate loans. I don't say that. You're right. They did choose. And now they're feeling the consequences. Nowhere do I mean to gloss over their mistakes. The broader point is that a tax-code that leaves the debt-saddled middle class down to their very last dollar at the end of every month sets a trap for economic implosion when both they and others make financial mistakes. The defaulters borrowed irresponsibly, true. But lenders also lent irresponsibly. Wall Streeters rated bonds irresponsibly. In short, a lot of wild stuff has happened. Problems have many causes. I picked this cause because no one else seems to be making the connection. To tell you the truth, I'm really not too concerned about whether its Bush's fault. But a tax system that does not leave room for the errors of ordinary citizens in finance is a tax system that ignores reality and makes the larger American system more susceptible to shocks. My concern is that the United States have a tax codes that supports the economic system through tough times. A good tax code would push a bit more money into the pockets of the middle class so they could make their debt payments, while only raising capital gains a tad, so that cash could move (again) at the top. News continues to come in that the sub-prime mortgage crisis is not a sub-prime mortgage crisis, but a crisis more deeply affecting the American system. The property firm RealTrac has announced that there was a foreclosure or repossession of 1 out of every 693 US households in July. The hard number 179,599, is up 93% from last year. It was also reported that "troubled assets" at federally regulated savings and loan associations were up 49%. It's important to understand what "troubled assets" means in this report. First, they're mortgages that are more than 90 days late or repossessed. Second, and most importantly, they are prime or jumbo mortgages. In other words, they're mortgages to people and companies who have good credit histories (unlike sub-prime borrowers who are more likely to default). And there's carnage on the layoff front. Accreditted Home Lenders, a mortgage company, announced it will cut 1,600 jobs, 62% of its current work force. And, for the record, that will be down from 2,600 as of today, which is whole lot less than the 4,200 employees at the start of the year. It's also stopped taking loan applications. This, of course, is in addition to the increase in volatility in the financial markets as banks have grown more and more nervous about lending to each other. It's at points of near (or is it full on?) crisis like this where I like to try to find the cause of the problem. True, the housing bubble exploded. True, Wall Street did some fairly foolish rating of credit derivatives and bonds. But are there any other factors surrounding why middle-class Americans, pehaps the world's most nimble debtors and consumers, suddenly can't pay their mortgages? Well, I found an answer. Apparently a mere 11,433 of the total 134 million US taxpayers saved $1.9 million on investments as a result the Bush tax cuts. That would be $21.7 billion in total. One imagines that might go pretty far toward making a few monthly mortgage payments. What about the 90% of Americans making less than $100,000 a year? (Yes, those people). They saved a wopping $318 on their investments. That's a whole extra $26.50 to put toward a monthly mortgage. And, however small, that $26.50 will be at least a little helpful as the average income for this same group went down. There's a serious conclusion here. I'll acknowlege that there are other factors involved, but I'll also say this: this tax code is nowhere near a failed attempt at "trickle down," it's an invitation for the American system to explode in all directions. And that's not populist. It's in defense of a system that sustains us all. On a slow news day like this, it can be fun to put things into context. A story like the one in WaPo comes along, where US President George W. Bush laments that he's had trouble "ending tyranny in our world" because of US "bureaucracy". Now, everyone in the US can admit the bureaucracy's gotten a bit rough since some of the new 9/11 legislation. This said, Mr. President, shedding some light on the last six years of your government might help us figure out why it seems so tough preserving democracy and ending tyranny in the world today. In fact, Mr. President, we'll do it this way. We'll pretend I'm not a mere private citizen with a voice, but your advisor - a member of the Cabinet. And we'll pretend it's six years ago. 1) Do not use cheap legal language to justify the existence of a military prison at Guantanemo Bay that holds prisoners of war without trial and spits in the face of Habeas Corpus rights -- the legal bedrock of modern civilization and the pride and dignity of governments ruling over the English-speaking peoples for the last 500 years. 2) Do not take unilateral action to start a war that is counter to the interests of the American people, counter to the national security interests of the United States, and undermines the authority of the United Nations -- the only possibility the community of free nations might have to legislate the world in a way that secures liberty for all humankind. 3) As leader and news figure, do not consistently refuse to acknowledge reality and have colleagues spread bad information in a way that corrupts the American news landscape, spurring hatred among the American people and undermining American civil society. 4) If, by chance, you do happen to do all of what I've told you not to do. Do not appoint ambassadors and government officials that drive a wedge between the US and European governments in an attempt to justify the poor, ill-planned, unnecessary war, that (hypothetically, of course) would be counter to the interests of nearly every nation in the world except Iran. It will be hard to plant trees abroad if you burn the forests at home, Mr. President. It's the ash on your hands, sir. It will do something to the seeds. On June 21, Russian President Vladimir Putin invited Alexander Filipov, Russian history teachers, and Russian historians to his residence to discuss two new manuals about how to teach Russian history (No WSJ subscription? Here's WaPo.) Mr. Filipov, deputy head of the National Laboratory of Foreign Policy, is editor of the guides. The manuals are expected to form the basis for history lessons in Russian schools beginning next year. As Leonid Polyakov, professor of political science at the Higher School of Economics in Moscow, has put it: "Teachers will be able to incorporate this national ideology [contained in the manuals], this vision, into their practical work in a normal way and use it to develop a civic and patriotic positon." The manuals are disturbing - both for their judgments on Russian history and the views they present of the current international political situation. The guides present Russia's "new democratic political culture" as "the main instrument of its rebirth and rise," while it describes Joseph Stalin as "the most successful leader of the USSR." But the manuals do far worse than mis-labeling what is primarily a one-party political culture and lauding a man whose reign as dictator of the Soviet Union is estimated to have killed up to twenty million people. US and European leaders would do well to direct their attention to the guides' attitudes on petroleum markets and international political affairs. One excerpt reads: "The development of the global political process will depend on Russia's decision on where to send its oil and gas. It's enough to deprive a rival of energy for development – in the geopolitical battle, such an act could be a defining moment." This perspective, of course, directly disregards rule of law and rejects a sensibly regulated free market -which are the foundations for free and civilized society. It is equally disturbing in light of the realities of the nationalized Russian energy sector. Russian gas and oil is principally distributed by GazProm and TransNeft, respectively. Both corporations are generally perceived to be state-controlled. GazProm, in particular, owns and controls all pipelines that export natural gas outside of Russia. In July, the Russian State Duma voted to give both corporate giants' employees the legal right to carry firearms.The law places no limits on the number of people the companies may arm. GazProm, at last count, had around 430,000 employees. "You will teach children in line with the books you are given and in the way Russia needs. To let some Russophobe [expletive], or just an amoral type, teach Russian history is impossible. It is necessary to clear the filth and if it doesn't work then clear it by force." Mr. Danilin is an editor at the Effective Policy Foundation, a consulting firm that works for the Kremlin. See additional coverage by WSJ. What has gone wrong in America? One of the biggest problems is how we speak. Public discussion about the government in our republic is a serious thing. If it is founded on a sincere effort to acknowledge a mistake and fix it, then it is worthwhile. If it is an attempt to clarify a murky point of policy or public opinion so that the People and the government may debate in a way that better fixes problems, then it is helpful. If it is based on an honest effort to discover a broken principle and propose a plan of action to re-build that principle, then it is valuable. Then people will have good things to say. But if criticism is hurled in the spirit of anger, hate, or for the sheer pleasure of waging a personal attack, then it is harmful. It is harmful because it poisons the language of the public debate. It warps how the government and the People speak which, in turn, warps how they see. How they see is how they will vote and act. When all public discussion becomes personal attacks and angry shouts, it ignores the real problems, which are the true opportunities for solution. The debate produces bad results or no results at all. Policy is no longer practical and rarely in the interests of the nation as a whole. When policy suffers, everybody suffers. The nation suffers. The People suffer. The government suffers. Politicians who would be honest but, unfortunately, fail in strength, run for cover, while men who lack all qualities of good leadership except an instinct for power rule the day. The nation’s interests are ignored and its principles are corrupted. The Republic reaches its low-point in effectiveness. The People grow hopeless and frustrated. In the coming year and a half, we must teach ourselves to speak in a way that recovers our dignity. It will be the duty of politicians and journalists to avoid personal attacks and cheap shots, for it is they, more than anyone, who shape the character of the public debate. But it will also fall upon we, the People of the United States, to hold ourselves to these standards of good speech. Good speech doesn’t mean perfect grammar or long, "sophisticated" words. Good speech is about the spirit behind the words – the honesty required to see the real problems, the determination to look for ways to fix them, and, the willingness, when necessary, to seek clarification and compromise. If we succeed in this, we will pull the United States out of some of the darkest days in its history. We will choose leaders capable of meeting the great challenges of the 21st century. If we fail, we will have more of the same. So an effort is required of everyone – Liberal and Conservative, Democratic and Republican, all of those somewhere in between – to change the spirit of the debate in our nation. And the only way that all of us will succeed in that effort is if each one of us makes that effort. Dr. Sentanu’s words go beyond the challenges facing Christians in the United Kingdom. Indeed, it is this same language of fear that has exaggerated the threat of terrorism as the so-called ‘War on Terror,’ and directed the attention of the American news media and the American People into loose spirals of unproductive speculation. These habits of speaking – that, in turn, are habits of thinking and feeling – are a virus that has infected too much American policy, too many news reports, and too many American hearts and minds. There is no doubt that organized groups of violent Islamic extremists pose a minor to moderate threat to the financial stability of the United States, its critical infrastructure, and, to a lesser extent, the American way of life. There is also no doubt that the government ought to take measures to prevent attacks, and that the media ought to report the facts. That said, the language of fear is over-used and, worse, over-used to the point that it has become so common as to blend in with a normal political climate. Participating in this language of fear has exacted a far greater toll on the United States than any terrorist attack can or will. The obsession with hypothetical attacks in the American government and the American news media consistently fills up the People’s minds with images of disaster. This has created a general atmosphere of paranoia that has led to poor decision-making within the White House and persuaded the Congress and the People to support some of the worst foreign policy decisions in American history. It was, after all, this general atmosphere of fear that reigned as Congress and the American public readily supported the Bush administration’s decision to invade Iraq. This war has damaged the United States reputation amongst its European allies, replaced a stable state with deeply unstable quasi-state of warring factions, and weakened the United States’ ability to posture itself against Iran. It has created a feeling of hopelessness and frustration all across the United States, and it has cost hopeless and frustrated taxpayers nearly half a trillion dollars. The truth is that there are far greater threats to the American system, American financial stability, and the American way of life than terrorism. The obsession with this possible, but rare disaster of minor impact – a terrorist attack – distracts the national attention away from the highly likely disaster of major impact – global warming. As the coming election approaches and we have a choice in how to direct our attention toward visions of the future, it will do all Americans well to keep this in mind. If our generation does not change the character of national debate now, it will see its own dignity destroyed as a result of bad policy, its children will see their financial stability and physical health put into peril by rising sea levels, and a generation of grandchildren will face the loss of the Human Home. This will surely be cataclysmic for the United States and for all of humankind. It does not matter how high the Freedom Tower shoots into the sky if all of Lower Manhattan is under water. Our priorities and how we direct our attention must be balanced with this in mind. Yesterday the Senate Judiciary Committee issued subpoenas to the White House, the office of the Vice President, and the Justice Department, taking steps to determine whether or not the offices violated the constitutional principle of checks and balances with their decision to wiretap American citizens without first obtaining warrants (Washington Post, NYT, BBC). In letters attached to the subpoenas, Senator Leahy made note of the fact that the Senate Judiciary Committee has made “no fewer than nine attempts” to obtain the requested information. The committee continues its meaningful effort to clear the cloud of secrecy within the executive branch that has degraded the integrity of American government for the past several years. White House spokesman Tony Fratto responded to the request with a statement both misleading and divisive, declaring: “It is unfortunate that congressional Democrats continue to choose the route of confrontation. Mr. Fratto’s remarks do not reflect the reality of the 13 – 3 vote in favor of issuing the subpoenas, with Republican Senators Hatch, Specter, and Grassley all supporting the measure. These votes added Republican weight behind the push to make clear whether or not the executive branch broke the law and overstepped its powers. Initial signs (particularly today’s White House decision to invoke executive privilege regarding documents that relate to the firings within the Justice Department (Washington Post) suggest there will be a long and protracted battle between the White House and the Senate. It appears the White House is poised to thwart all efforts of the committee to bring the truth into the public record so that the president’s questionable use of power can be examined by the legislative branch and the American people. It is unfortunate when valuable time that might be spent crafting practical solutions to the nation’s problems is instead used wrestling information out of a black hole of presidential secrecy that is counter to the spirit and principles of American democracy. The responsibility for transparency falls upon the White House, the office of the Vice President, and the Attorney General. The Senate Judiciary Committee has no choice other than to pursue this right and just path until the Bush administration gives the nation confidence that it is acting in accord with the law. Republican or Democrat, the senators who voted in favor of the subpoenas ought to be applauded.